There’s the 3:58 pacer. I’ll stand by him and hope I can stick like glue to him for the race. (Looking around) I wonder which of us will hit 3:58 and which of us will blow up. I really hope I can do it because I don’t want to have to do another road marathon to get the sub 4. I could have done with another wee really but those portaloos at the start smelled disgusting. It’s just in my head. I’ll be ok.
Phew, company! I really wasn’t looking forward to running this on my own. Mat’s much quicker than me though, I hope he doesn’t feel I’m too slow and I really don’t want to feel like I have to run quicker than I’ve planned. It’s ok, we’ll stay between the 3:58 and the 3:59 pacer. It’s too claustrophobic. I am really not comfortable THIS close to SO many people. Hurry up people. Where’s the 3:58 pacer going?? He’s crossed the line already, we must be a minute behind already? He’s a pro, weaving in and out. Damn, watch has turned itself off waiting – hope I can find GPS again in time. Here’s goes. Don’t go too fast, stay disciplined. Stay ahead of the 3:59 pacer and we’ll be ok.
That 3:58 pacer has shot off! He can’t be doing the right pace. Don’t worry, just keep an eye on watch pace and stick as close to 9 minute miling as we can. We’re a little ahead of pace but feeling comfortable, this is good. First loop done, there’s Old Trafford again and White City. Pacing going well, first 5k done in around 27 minutes. We’re heading out of the city now, head down and just keep counting those miles down. Water station. I don’t need a drink but have one anyway, few mouthfuls to rinse your mouth out. Keep hydrated, it’s pretty hot. Oops bit quick that last one. Slow it down a little, don’t want to blow up later on. I’d better take a gel. I don’t really need one but I’ve been running 40-odd minutes now so I’ll take one every 40 minutes to keep my carbs topped up. Really happy with this pace, it feels good. 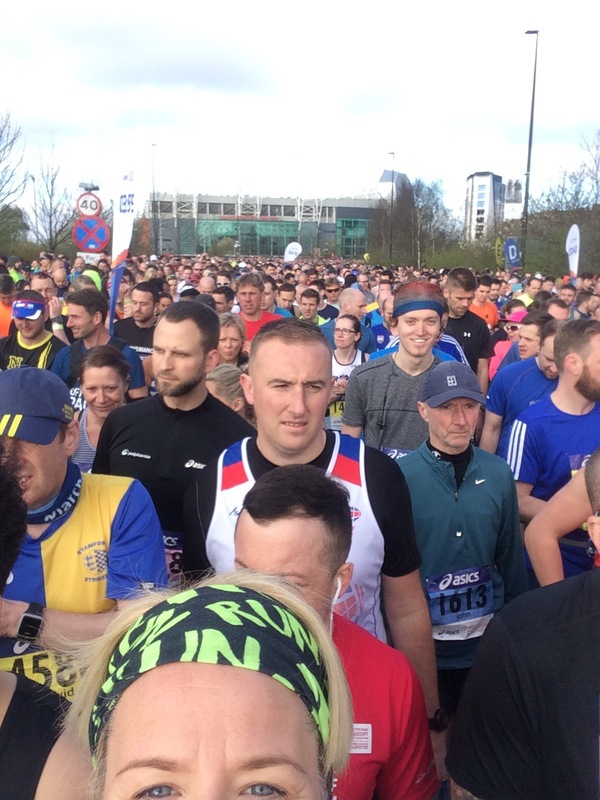 These Chorlton Runners are getting lots of shout outs. I haven’t had one yet but it’s the first marathon I haven’t had my name on my top as I remember it all getting a bit much at London. I guess my name on my number is pretty small. Whoop passed the first timing mat at 10k in 55:28. Only 20 miles to go! Feeling good and pace exactly where it should be. Oh look, I used to go into that pub as a student. Memories!! Are we in Sale already? Getting a tad quick again. 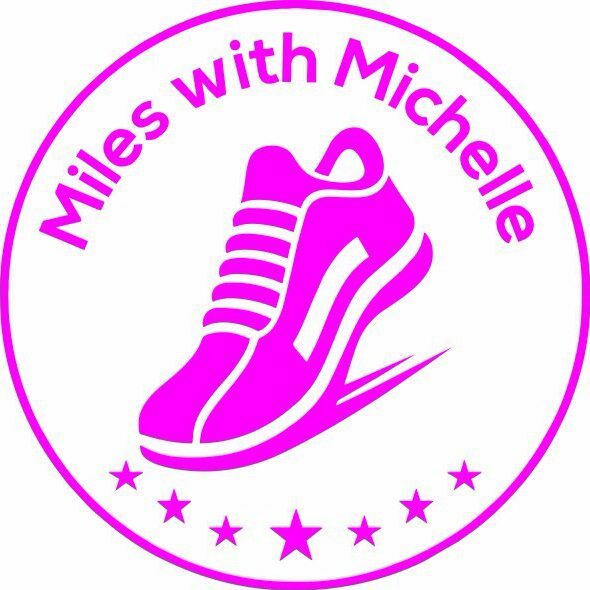 Chat to a bloke who’s doing his first marathon in over ten years and hasn’t done any long runs. I really hope he does ok today. Look out for Rick as he should be around here somewhere supporting. “He was back there” says Mat, didn’t you see me shout and wave to him? Oops, I’m clearly in the zone now, focusing inwardly. Wow the crowds here are amazing! It’s so loud! Whoop, first shout out! I heard a Shelly earlier but I know that wasn’t me. Why are my hips hurting? I run far longer distances than this, why am I in this much pain? It’s the bloody road, I knew there was a reason I stick to trail. Bloody tarmac and concrete IS bad for you. Just ignore the hips, I’ll be fine. A nice marker to hit. Only 10 miles plus another 10k to go. Wow are they sub 3 hour runners coming back towards us on the other side? I wonder how far in they are? Maybe half marathon? I’ll see if I can spot anyone I know. Oh there’s David, looking strong ahead of the 3:15 pacer. And there’s Daz looking comfortable just with the 3:30 pacer. Wow these runners look so comfortable at that pace – how do they do it? Ooh jelly babies, how nice. Yes please. Round the corner. Wow how long IS the loop until we head back? I’d better take another gel too. If I took one at 40 minutes, I’ll take another at 1 hour 20, a third at 2 hours then I’ll have run out for the second half of the race so I’ll have to remember to pick some more up from the fuel stations next time we pass one. Those Chorlton Runners keep overtaking us then dropping behind again. I need a Chorlton vest – they’re getting loads of support. Ok this feels like a hill. Who said this was flat. Push into it and get up there. Whew and back downhill. Go with gravity! What IS that noise? Oh it’s that lady with headphones on singing loudly. I don’t recognise the song. What’s the song? She’s clearly enjoying herself. Good on her. Through the half marathon point in 1 hour 55. I might actually be able to do this. We can count down to the finish now and we are actually heading back now. There’s a gel station coming up around the corner. I remember seeing it earlier. I’ll grab one as I’ll need more gels than the 3 I brought with me. I’ll take another of mine now. Oh there’s a guy walking backwards. Is he doing the whole marathon backwards? Wow. Ten miles to go! Woohoo. Well and a teeny bit. Wow I think I used to work there? Where am I? Yes I did, trip down memory lane back to when I was a student. Struggling here. I need to slow down a bit I think. (Mat decides to run on ahead and stretch his legs.) OK I don’t feel like I’m holding Mat back now but I’m worried I won’t have anyone to spur me on now. It’s ok, you can do this. Just keep going, keep the legs ticking over. “Hello, are you the Michelle off Twitter?” There’s a friendly looking chap who introduces himself to me as Paul. I suppose I am, yes. It’s nice to have some company again, I don’t like running on my own, and it helps to take my mind off the pain. After a while Paul waves me on as says I’m going a bit quicker than him. On my own again. Wow this bit is boring. And quiet. There are no spectators. I feel tired. My legs feel like they don’t belong to me. My back is hurting. I’ve still got an hour to go. Have another gel, then only another gel after that to go then I’ll be finished. Am I so bored I’m counting down the race in gels? Yes I am. 3 hours for the first 20 miles. I’m on track for sub 4, got an hour to do 10k. Can I do this? Can I actually do this? Bearing in mind I’m now running like I’ve pooed myself because my hips are hurting? How much pain am I prepared to put myself through? I’m breaking out the shot blocks – if I do one a mile that will give me something to look forward to. Wow I am so bored now. Not enjoying this at all. If I stop and walk from here it’s only 5 miles and I could still do a quicker time than I did my last marathon in. Yeah, at least it’ll be a PB. Who cares about a sub 4 anyway? Am I that bothered? Drinks!! And gels! Sod it, I’m having a little walk while I have a drink. I’m melting. I’ll have my last gel now too. Ahhhh that not running feels so good. You idiot, you’re probably not going to be able to start running again now. You’ve totally just sabotaged your entire race. Why would you do that? “I f***ing hate marathons” I say to the chap who’s also slowed to walk next to me. He agrees. Why do we do this to ourselves? He says he balances out his alcoholism with marathons. I sense he’s probably joking but I’m too tired to really know. Right, well the quicker we get to the finish line the quicker I can lie down and have a cry so let’s try running again. Ow. Yeah walking wasn’t the best idea, but the running is ok, just ignore the pain. Damn, that’s the 3:59 pacer just overtook me. Can I keep up with him? No. What pace must I be doing? I can’t look. It doesn’t matter. Let him go. I hate this marathon. Yes, lady at the side of the road, I hear you telling me to not let him out of my sight, but I’ve run over 20 miles, don’t you understand how exhausted I am? Have another shot block. That caffeine feels GOOD! Only 2 laps of parkrun to go. 20 minutes running. Come on, you can do this. I hear a “Hello Michelle” and a chap named Gray introduces himself to me who recognises me off Twitter. “How are you doing?” he asks. Struggling now, I say. Just want to get finished. “Want to run together?” he asks. We can try, I say, but I’m not sure I’ll be able to keep up with you. That self doubt has me in its evil grip. “I’ve just had a walk he says, but you look strong”. That’ll be the shot block I’ve just had, I say. I don’t feel it, but I run anyway. I feel tired and nauseous and I’m aching to stop running. I appreciated that chat even though it was brief. With those words in my head I run on. Something’s gripped me and I’ve sped up a little. I’m overtaking lots of runners and seem to have lost my new running buddy but I keep going. I don’t look back. I can hear spectators saying there’s the 4 hour pacer, so he can’t be far behind me but if I look behind, I’m done. I’ve lost it. Just keep moving forward. I’ve got 12 minutes to get under 4 hours. Can I do this? I think I can if I sustain this pace. I’ll be gutted if it’s seconds over 4 hours. I’d rather be minutes over, than seconds. Let’s see what these legs have left. How long is this mile??? I can’t even see the finish line. OWWWWW. What the hell was that? Did I stand on a nail? Ew my toes feel sticky. Blister. Wow I didn’t know they were that painful when they burst. OWWWWW the other foot now? What the hell is going on with my feet? Thank god I brought flip flops to wear afterwards. Ah we’re turning a corner. The finish line, is that it? It looks so far away. Ah there’s the 3:59 pacer – how have I managed to catch him up? That’s good, let’s overtake him. I think he’s slowed a bit and let his group run on. I think I might just do this. That finish line isn’t getting any closer. Come on, push. Think good strong form. Relax your shoulders. Move your arms. Oh it’s Dan, he’s made it. I’ll wave and look happy, but don’t slow down you’re nearly there. The finish line. Arms up. Happy relieved face. 3:58. You’ve bloody done it woman! I can’t walk. 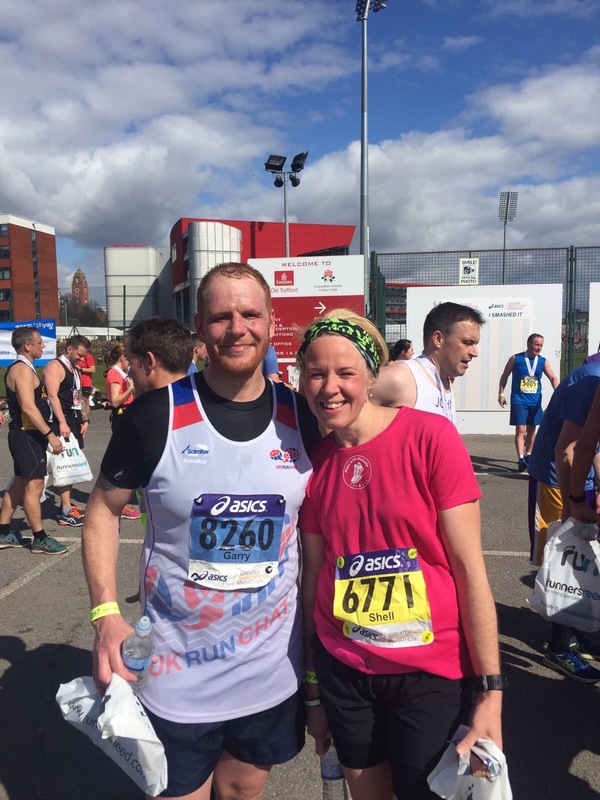 How have I just managed to run a marathon? Where do I go? I can’t focus. I need to sit down. Oh look, goody bags. Small t-shirt please. And water. Yes please. Is there food in here? I need real food. A protein bar, that’ll do. Oh there’s a UKRunChat vest, that must be Garry. I say hi to Garry who introduces me to Caithy and we have maybe 6 attempts at a selfie. Everything is so difficult after a marathon. 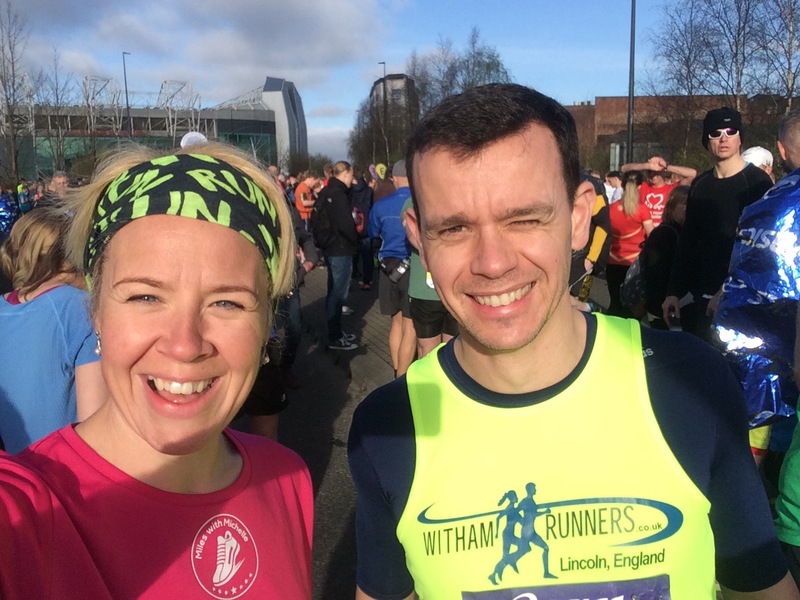 A chap called Andy comes and says hi who also recognises me off Twitter so we congratulate each other – he’s run an amazing time! I need my bag so I can find my flip flops. Oh there’s alcohol free beer too, yes please. I need carbs. I don’t like beer but this tastes INCREDIBLE. I need a wee though. Hello lady sitting on the floor, please would you look after my beer, I don’t want to take it into the portaloos. Ahhhhhh. Relief. I need to get this sticky sweaty top off and a dry one on. I need to get these trainers off too. I’m not looking at the blisters yet, I’ll look when I get home. Owwwwww, foot cramp. How on earth am I meant to get these flip flops on without touching my blisters? Slowly slowly, no I’ll fall over. Someone help me, why is this so difficult. Owwwww. Right let’s try the other one. Owwwwww, this one’s cramping too. I can see all the veins tensing. That’s disgusting, and really hurts. Why is this so difficult. Right, stand up, let’s go find my family. I’ve done it. Proud of myself today. 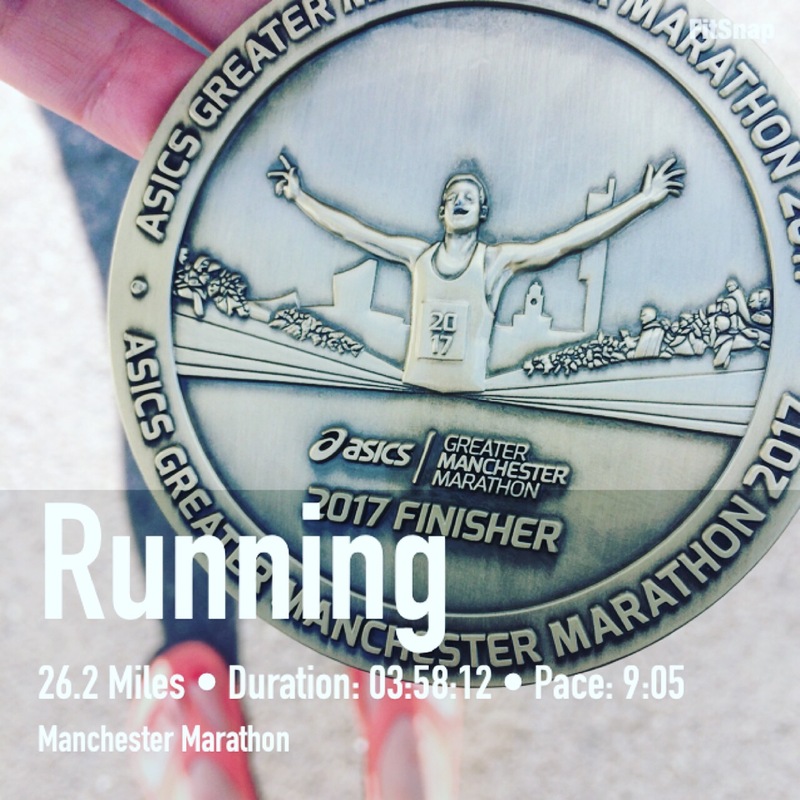 Thank you to UKRunChat and Breathe Unity for the opportunity to run the ASICS Greater Manchester Marathon 2017. I loved reading this. 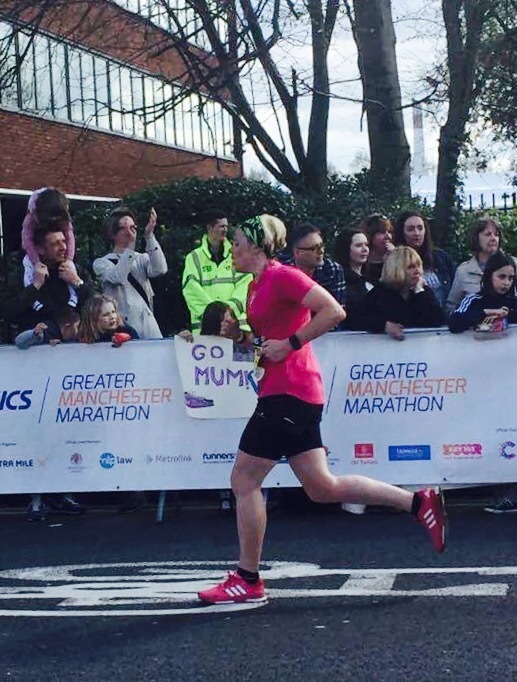 I ran Manchester in 2014.